A heat sink is a non-electronic, passive mechanical component that has a vital role in the reliability and performance of ICs, PC boards, modules, chassis, and more. Heat sinks often don’t get much attention, at least not in the early stages of a design. This FAQ will look at the basic thermal principles of these vital components as well as their physical construction. It will not look at the bigger issues of system thermal management and general cooling options. It will also not delve into the sizing of heat sinks, as that material is available via numerous widely available resources. Finally, it will not discuss other heat-management components and techniques such as heat pipes, cold plates, liquid cooling, radiation cooling, and Peltier cooling. Even with these limitations, heat sinks are available in a huge array of shapes, configurations, and sizes. (Figure 1). 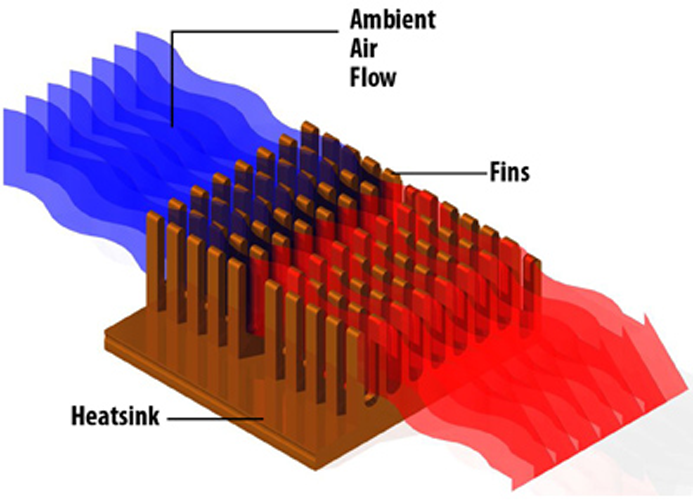 Q: Why are heat sinks often considered later in the design cycle? As they are 100% passive, non-electronic components, designers know they can be often added “later” or “at any time” — which is true to some extent. Another reason is that the design team nay not yet know how much heat needs to be dissipated, from where, and by what, since that is a function of which components are chosen and the product physical arrangement and enclosure, as well as other functions such as power supplies. Also, since heat sinks are a mechanical and thermal discipline, many electronic engineers have little formal, quantitative understanding of their role, sizing, and selection. Q: What is the role of a heat sink? A: In basic terms, a heat sink has two roles: 1) to “pull” heat away from a hot component, and 2) to provide a conduit or vehicle for that heat to be removed from the sink itself. In this way, the heat sink stays cooler than the component being cooled, and so it can continue to pull that heat away from the component. For diodes and ICs, the objective is to keep the junction temperature below the maximum allowed value as specified by the vendor; at a system-design level, it may be to keep it far lower to minimize temperature-related drift or improve long-term reliability. A: Yes, many ICs are extremely low power components. But there are quite a few that may still be dissipating relatively large amounts of power, such as processors, FPGAs, power amplifiers, and even passive components such as larger-wattage resistors. Also, while individual components may be low power, so many of them are tightly packed onto the PC board or enclosure, that the aggregate heat load rises to a level which may lead to excess temperature at a few of the hotter ones. Even LED-based bulbs get too hot at their base and need some sort of heat sink arrangement built into their base (Figure 2). Q: Why does the heat that the heat sink has drawn from the component need to be removed? A: The laws of thermal physics are clear: without an active heat-transport/forcing mechanism (such as a heat pump) heat can only travel from a warmer area to a cooler one. If the heat sink is not cooled, it would eventually reach the temperature of the component to which it is attached. In turn, the flow of undesired heat from that component would slow down and stop, and the basic function of the heat sink would be negated. Q: How is the heat removed from the heat sink? Radiation is a function of surface area and finish and is generally a relatively small part of the heat-removal process for heat sinks. Even so, some heat sinks are blackened using anodization to improve their emissivity. Conduction is the flow of heat through solid material and is how the heat of the component being cooled reaches the heat sink itself. However, it is generally not how the heat sink’s heat is removed, but it can be as in cases where the heat sink is mechanically attached to another solid (such as a PC card’s metal edging and the card cage’s rails). Convection (the flow of a liquid or gas fluid) is how most heat is removed from the sink. In most cases, this convention is the free flow of ambient air (Figure 3). This can be passive with natural, unforced air flow with the now-heated air rising and so cooler air to comes in from the bottom (Figure 4). Unforced convection is most effective when there is a clear, direct airflow path form bottom to top. 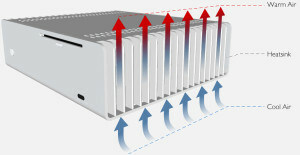 It is far less effective when the airflow path is horizontal, as the heated air is largely “trapped” inside the box. Keep in mind that moving air is a somewhat good conveyer of heat, but stagnant air is an insulator — think of Styrofoam, or even the fill ion warm coats. Q: What if the natural airflow is insufficient? A: If the airflow is insufficient, or the direction of airflow is not vertical, then forced air (usually provided by a fan) is the need for active cooling. A fan will greatly increase the airflow across and through the heatsink, but at a cost in power consumption, size, weight, reliability, and noise. Most engineers try to avoid using if possible, but for many sections that is not feasible and a fan is used. [Interesting side note: in the weightlessness of an orbiting spacecraft, such as the International Space Station, forced air must be used. The reason is that there is no gravity or “up and down, and thus no convection. The heat that the component or enclosure generates and is conveyed to the heat sink just lingers around that source and does not rise (“rise” has no meaning in a weightless environment). Instead, the heat becomes just stays like a warm heating pad around the source and is actually counterproductive, which is worse than ineffective. Q: What is the relativity of a heat sink? A: It is superb: one of the attractions of the heat sink is that it is passive with no moving parts, and can’t fail unless physically abused or damaged. However, its effectiveness can degrade if the cooling surfaces responsible for convection get covered with dust build-up over time, as the dust acts as an insulating layer which prevents the cooling air from reaching those surfaces. Q: How do you know what kind of heat sink to use, and how big it should be? A: The analysis begins with a thermal model of the component with which the heat sink is associated, usually an IC (Figure 5). The model is used to trace the heat and dissipation from the IC active junction to the case, and then to the ambient environment. The analysis then proceeds to use this result to determine the needed air flow, and then the amount of surface area the heat sink needs under given operating conditions. This analysis is discussed in some of the references; vendor websites also provide guidance. Part 2 of this FAQ looks at these passive metal components in more detail. You have cleared the most confusing doubts about the heatsink. I want to know whether using a thermal paste on heatsinks really beneficial or not and if yes what would be your suggestion for the heatsink of Lenovo e440. Re heat sinks and thermal paste: some sort thermal interface is needed, either paste or pad (see Bergquist). Otherwise, tiny air voids will seriously degrade thermal flow from hot source to heat sink itself. Sorry, no suggestion for Lenovo.